Just one 13 km stretch along the Waimakariri Gorge includes 16 tunnels. The nostalgia and romance of the golden age of rail is attractive to many people who want to experience a journey as something more than simply getting from point A to B. In the first half of the twentieth century, trains were the easiest, most reliable and stylish way to get around New Zealand. The TranzAlpine train recaptures that bygone era, as you roll by scenic mountains and waterfalls, rivers and gorges in comfort and style. 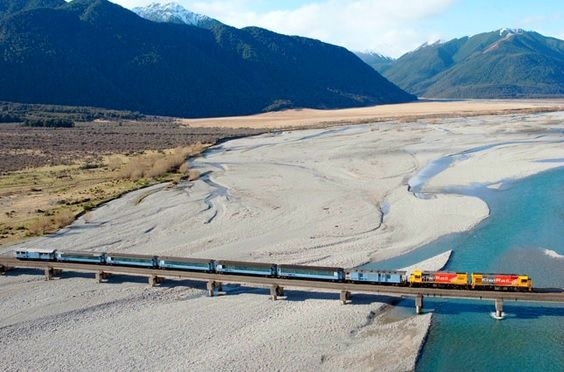 The TranzAlpine Express, regarded as one of the World’s great train journeys, takes you on a breathtaking 223 km ride from Christchurch to Greymouth, the largest town on New Zealand’s west coast. The Midland line, which took 37 years to build, had many daunting barriers to overcome before it was finally opened, with the completion of the Otira tunnel, in 1923. Just one 13 km stretch along the Waimakariri Gorge includes 16 tunnels and the 73 meter high, staircase viaduct. In November of 2012, the TranzAlpine marked its 25th anniversary by introducing new train carriages with panoramic side and ceiling windows. Overhead HD video screens highlight points of interest and each seat is equipped with headphones for you to enjoy a rolling GPS triggered commentary about your journey. When it’s time for a snack, you can visit the licensed cafe car. They serve breakfast all day and, if you can manage the wait, about an hour into the trip the TranzAlpine makes a special stop at Springfield station for fresh muffins. The Canterbury plains are as flat and pastoral, as their backdrop, the Southern Alps are rugged and majestic. As the train leaves Springfield, it begins its climb across the heart of the Southern Alps. The route roughly follows the Waimakariri River on the eastern side of the Southern Alps. 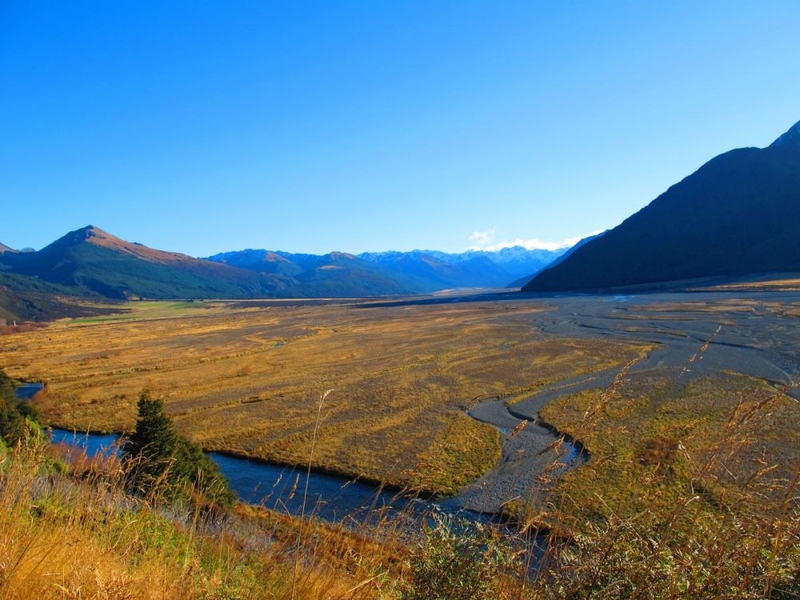 This is one of the south island's several braided rivers. During dry months you may see just a few small streams of water. When storms blow in across the Tasman Sea during the spring snow melt these wide gravel flats are filled bank to bank with rushing water. 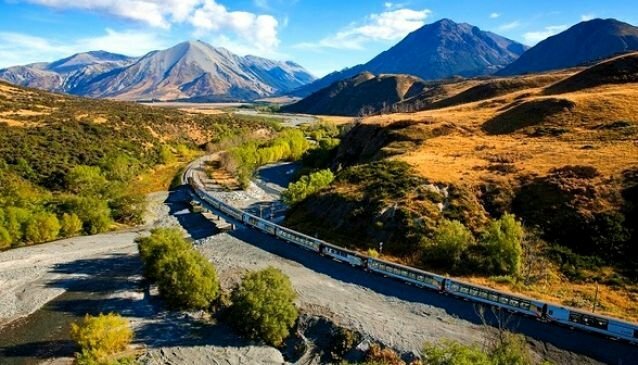 As the train leaves the wide braided flats of the Waimakariri, you will catch a glimpse of Mount Oates looming high over the Mingha river valley. One of many peaks in this part of the Southern Alps named for Arctic explorers, Lawrence Oates was a member of Robert F. Scott’s doomed mission to the South Pole. Several stops along the way give you an opportunity to plan an excursion or stay and explore a less traveled corner of New Zealand. 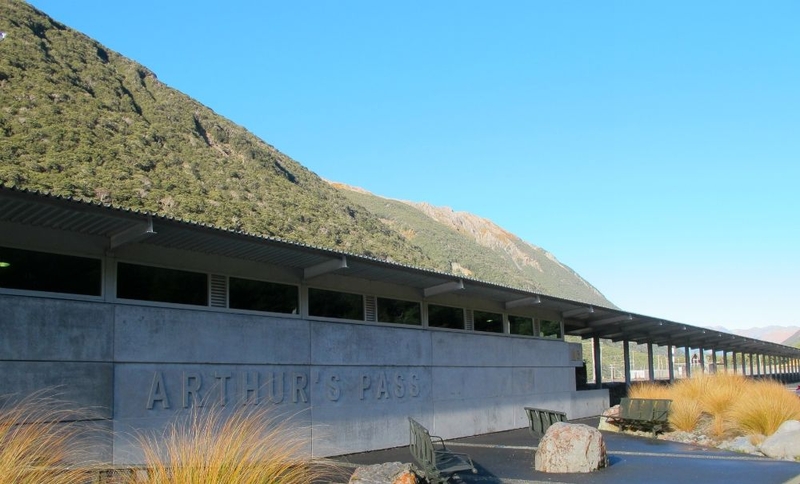 The cozy alpine village of Arthur’s Pass is the final destination for many adventure seekers on the TranzAlpine. In the middle of Arthur’s Pass National Park, the village is the starting point for several popular mountain hikes. The Avalanche Peak trail begins a few meters from the train station behind the park’s visitor center. The train schedule allows you to spend a little over five hours in the park before catching the return trip. The Devil’s Punchbowl Falls and Bridal Veil Falls are two shorter hikes that begin from the village. There are two popular eateries, the Wobbly Kea and the Arthur’s Pass Cafe, to relax after your walk. Picturesque Lake Brunner is gaining a reputation as a tourist destination. The TranzAlpine stops at Moana, a small village on the northern end of the lake. Stopping off here leaves you two hours and 40 minutes before the return train. Plenty of time to take a cruise on the lake, fish for trout or just have a relaxing lunch at the Station House Cafe, directly across the street. Greymouth, the western terminus of the TranzAlpine, serves as a great gateway for exploring attractions of the west coast, like the artist community of Hokitika and the Franz Joseph and Fox Glaciers. 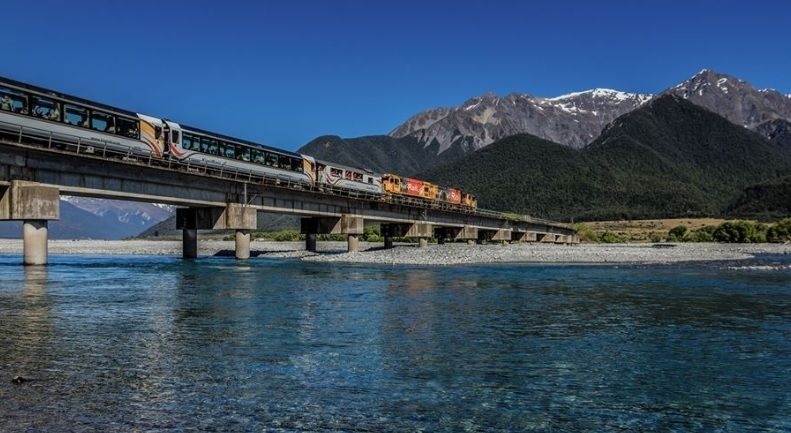 During the train journey, your guided audio tour highlights places and events of historic interest along the route, including the Otira tunnel and the timber and coal industries that spurred the development of this rail link. You can sample some history first hand with a bottle of Monteith beer, available in the cafe car. The Monteith brewery has operated in Greymouth for nearly 150 years. Their newly renovated brewery and restaurant is just a 10 minute walk from the train station. The TranzAlpine runs year round and many people have their favorite season. In the spring, colorful scotch broom and lupine paint the countryside. Summer brings the amber browns of the tussock grasslands, but winter is a special treat. If you are brave and bundle up, you can enjoy an unobstructed view of the Alps in all their snowy grandeur from the open air viewing car. Location: 35 Troup Drive in Addington, Christchurch. The TranzAlpine Express departs daily from Christchurch train station at 8:15 am and arrives in Greymouth at 12:45 pm. The return trip from Greymouth departs at 1:45 pm and arrives in Christchurch at 6:05 pm. Passengers are advised to arrive at the station at least 20 minutes before the scheduled departure. A free morning minibus shuttle is available to the station from all downtown Christchurch hotels. Check at your hotel for the scheduled pickup time or call TranzAlpine. Shuttles to your hotel are also available at the conclusion of your journey for a reasonable fee. In Greymouth, car rentals are available inside the station. InterCity Coachlines operates buses south to Franz Joseph and Fox Glacier and north to Nelson. Both depart from the train station at 1:30pm daily. A limited number of discounted tickets may be available if booking directly through www.kiwirailscenic.co.nz when accessing the site from New Zealand. Or, by calling KiwiRail directly at +64 4 495 0775 / 0800 872 476 (NZ).